What Is DD Form 1574? DD Form 1574, Serviceable Tag - Materiel is a form used to identify serviceable material in condition codes A, B, and C. A Serviceable Tag (the Department of Army DD Form 1574) must be applied to each repaired or overhauled part and may be used for new parts. 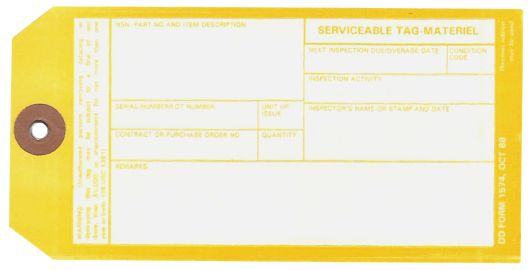 An alternative tag and/or label completed with the following information may be used for new parts only and applied to each individual part or individual unit package. Material condition tags and labels - along with the DD Form 1754, DD Form 1757, DD Form 1576, and DD Form 1577 - will be used to identify material when it might become mixed during maintenance, storage, or shipment within (or between) installations or when physical evidence of inspection is necessary for material control to prevent duplicate inspections. These labels are not for indiscriminate use on material that does not present problems in storage or transfer. The latest known version of the form - sometimes confused with the DA Form 1574-1, Report of Proceedings by Investigating Officer - was released by the Department of Defense (DoD) in October 1988. The related DD Form 1574-1 was last updated in October 1966. As of today, the Executive Services Directorate does not provide any links to or notices about the DD 1574 and DD 1574-1. A copy of the Serviceable Tag is available for download below. For new, used, repaired or reconditioned material which is serviceable and issuable to selected customers, but which must be issued before Condition A and B material to avoid loss as usable assets (includes material with less than 3 months shelf life remaining) prepare DD Form 1574/1574-1 and assign the condition code C (Priority Use).